It's January and a new year is in full swing! 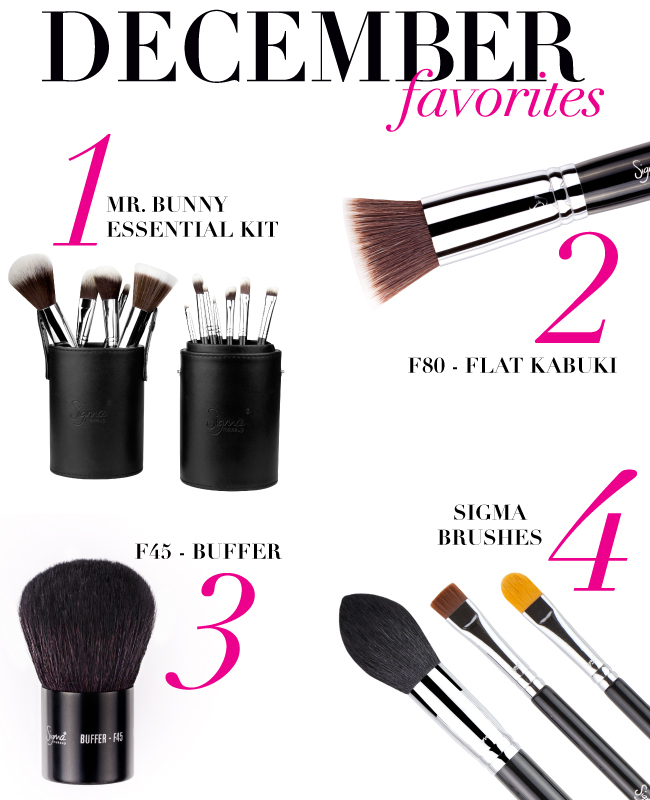 With that being said, it's time to mention a few fave Sigma products from the last month! Beauty bloggers and YouTube’s top makeup gurus always seem to have a favorite product from Sigma each month and we love sharing with you what each of them are. Keep reading to find out which products were most loved for the month of December and 2012 overall! BONUS -- don’t miss out on entering for a chance to win one of our best-selling brush kits! And now for this month's giveaway! 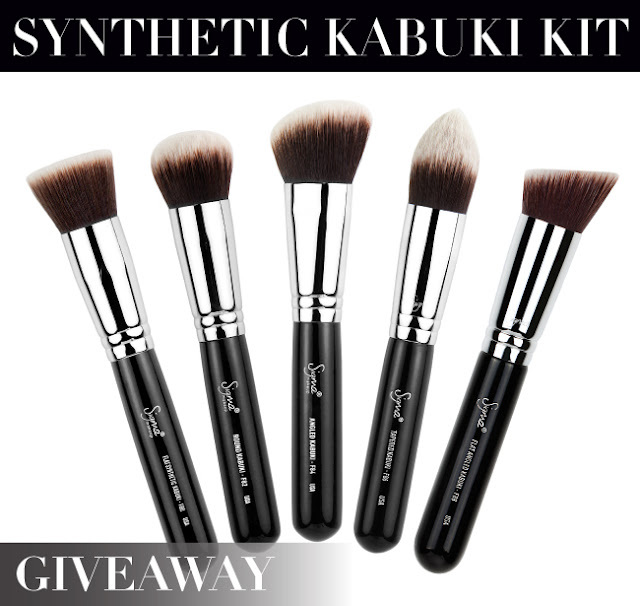 Fill out the form below for a chance to win the best-selling 5-piece Synthetic Kabuki Kit. This kit contains five face brushes that allow for a high definition, flawless makeup application. The brushes in this kit feature exclusive Sigmax™ fibers, uniquely designed to apply powder, cream and liquid products without absorption into the bristles. Note: One entry per person. International entries welcome. The winner will be announced in one week on the blog and contacted via email. I hope be lucky and get one of your amazing products. Thanks for the giveaway!!! i love sigmaa! :) thanks for this giveaway! What a generous giveaway! Thanks sigma! Thank you so much for this Lovely Giveaway!! Hoping to win something as I have never ever tried Sigma Products :) Keeping my Fingers Cross to win something!! Thank you so much for this Lovely Giveaway!! Hoping to win something as I have never ever tried Sigma Products :) Hoping to win something, Keeping my Fingers Crossed! Super cool of you guys to have a giveaway for such amazing brushes!!! I would love to try them out!!!! Thx for the opportunity to possibly have my very own set! I've heard great things and seen many videos showcasing them! Sigma is great! Love love love the giveaways! Done with the entry. (Crossed Fingers) Hoping to win. ^_^ Yey! Thank you Sigma! Que regalo más genial, me encanta!!! sigma is just PERFECT! In every girls makeup collection there's got to be some sigma brushes!! loving this so amazing giveaway!!!!!!! Love Sigma Kabuki!!! The Best!!! great kit!! love to win it!! Oh my god, this synthetic set - exactly what I need for my make-up work! I have a similar one of the brushes and I just dream to understand what they are - Sigma brushes! It is incredible that there is a chance just to get them! Thank you for this opportunity! Thank you Sigma I really appreciate the opportunity to join this giveaway! i love giveaways, thank you! i hope i win! Thank You Sigma. Happy New Year! Let is see if I have luck on this time! Sigma rules in affordable upscale makeup and beauty brushes!! Thank You Sigma for such an awesome giveaway!! Hello lovely Sigma'team!!! I dream to win this faboulous gift!!!! I still need many things to work as a "make-up artist"!!! So, to have this spectacular kit in my hands could be like touch the sky and to realize a dream!!! Thank you very much for tempt us with your excellent makeup and brushes!!! Big kiss an successful New Year!!!! love them!! hope to win! Thank you Sigma for another amazing giveaway!! This kit is high on my wishlist! Will the winner be selected randomly? Thanks for doing the giveaway, I hope I win this amazing brush set for my sigma collection! WOW!! Great giveaway. WEould love to win. Sigma brushes is a girls dream!!!!! thanks for doing the Giveaway!!!! I hope Im lucky this time! Thanks! YES YES YES!!!!! I hope I'll win! What an amazing giveaway!!! Like always!!! Thank you so so much!!! I love Synthetic Kabuki Kit!!! The quality that Sigma offer is the best in the world!!! I can sware it because I recently bought and used some Sigma's products like: Premium Kit, Dry'n Shape, Dare palette, F88 brush and P88 brush. I love all, but I've fallen in love with F88 and P88 brushes!!! I can explain the sensation!!! The result that I get is so perfect that it seems unreal, magic!!!! I'm like in ecstasy when I use them!!!! I dream to win!!!! I NEED to do it!!! Today I visited your site for take a look of your products. I want to have all, absolutely ALL!!!! Everything is so perfect and georgeous!!! It's an indescribable pleasure to use your brushes and shadows!!!! One day I will have all!!!!!! I hope so!!! Now my dream is to win this spectacular Synthetic Kabuki Kit!!!!! My God, what an amazing giveaway!!! !